Who we are and what we do! Click here for my Biography. 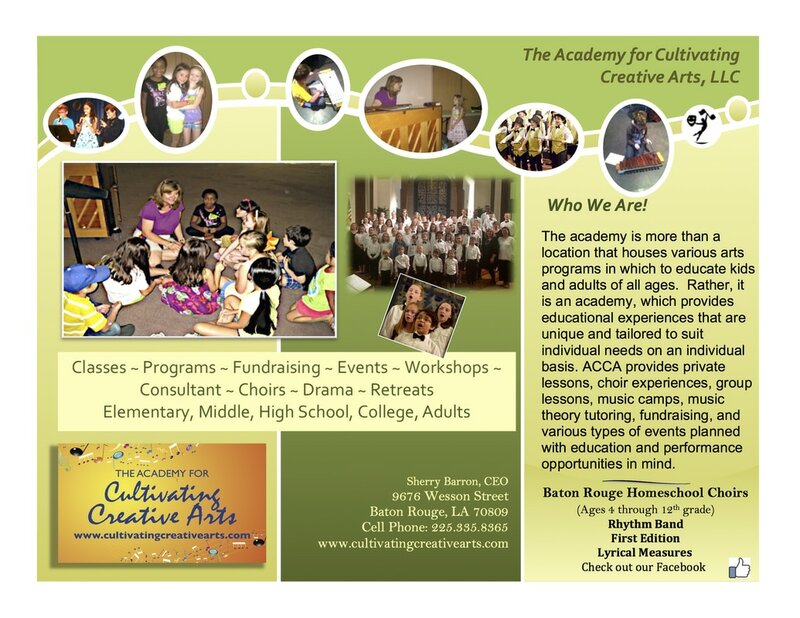 ​The Academy was founded and created by Sherry Barron, a National Board Certified Music Educator, with the intent to offer kids and adults of all ages the opportunity to explore and develop the arts of their choice in a safe and nurturing environment. The academy is more than a location that houses various arts programs in which to educate kids and adults of all ages. Rather, it is an academy which provides educational experiences that are unique and tailored to suit individual needs on an individual basis. ACCA provides group classes (young learner & middle/high/adult) private lessons, music camps, music tutoring, fundraising, and various types of events planned with education and performance opportunities in mind. ACCA has been contracted and out sourced to public schools and systems in order to fill a need for districts that are unable to hire a full-time professional teacher for their music education and performance needs. See Talent Spectacular! Other programs such as this can be designed and developed to fill your specific need! We offer Fall Festival, Christmas, and Spring musical presentations/or choir performances while educating, developing and uniting your students; while creating a healthy school climate for faculty, students, community, and staff! 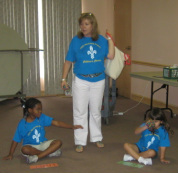 We are south Louisiana's sole-provider of educational, entertaining, fundraising, and professionally directed programs. Talent Spectacular! is schools venue for educating and providing a performing arts show that is designed for students to creatively express themselves through music, dance, drama, literature, or by any other means that is performance oriented. Our events are perfect for pulling school and community together while focusing on exposing and educating local talent to visual and performing arts! ACCA is also home for The Baton Rouge Homeschool Choirs. We offer homeschool students opportunities to participate in choral programs and Rhythm Band for the early learner. First Edition choir is for children in grades 2-5. The Lyrical Measures choir is designed for students grade 6-12. Children whose ages are 4-6 may participate in Rhythm Band. These programs meet on Tuesdays in the spring and fall and are 12 weeks long. An end of the semester finale is held the 12th week and all participating members perform as individual choirs. During the program, all participants convene and perform a highlighted work. BRHSChoir meets at The First Christian Church 8484 Old Hammond Hwy. Baton Rouge, LA. ACCA also provides Professional Development for teachers, principals, schools, church choirs, and organizations. As past Executive Board member of the Baton Rouge Symphony Orchestra, and Education Committee Chair, I can link you personally with outstanding symphonic experiences and performances for your students. Scroll below to see slideshow!